This statistic displays the top anti-rheumatics worldwide by revenue in 2017 and a projection for 2024. Enbrel, a drug developed by Pfizer, Amgen, and Takeda, is expected to generate some four billion U.S. dollars in revenue in 2024. Anti-rheumatic drugs is used to treat and slow the progress of rheumatoid arthritis. Rheumatoid arthritis is an autoimmune disease that principlally attacks the joints but also impacts tissues and organs. 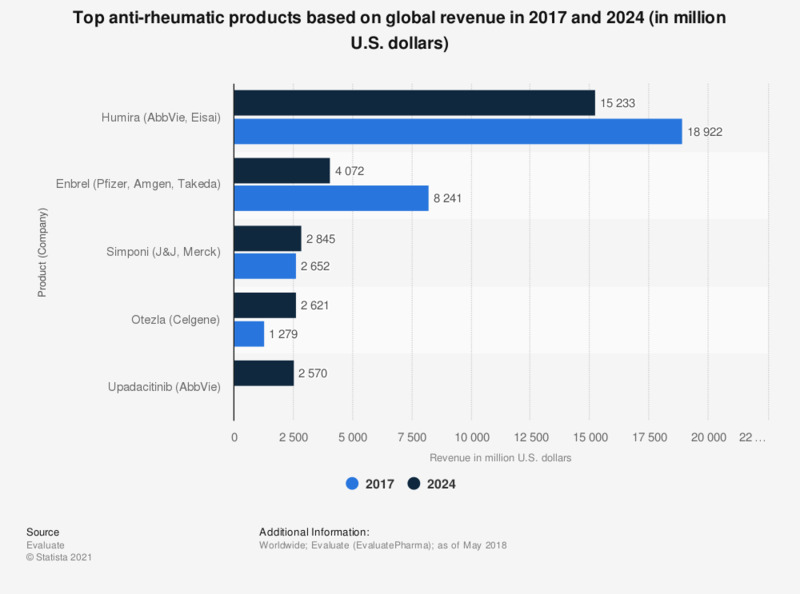 Some of the top anti-rheumatic products in the world include J&J, Merck & Co., and Mitsubishi’s Remicade, which generated 8.1 billion U.S. dollars in revenue in 2016 and is expected to decrease to 2.7 billion U.S. dollars by 2022. This drug accounted for over 15 percent of the global market in 2016. Remicade is a trade name for infliximab, an antibody used in the treatment of autoimmune diseases. It is marketed under the name Remicade in the United States and cost between 19,000 and 22,000 per year for patients. Merck & Co. markets this product as Schering-Plough in other regions. Merck & Co. generated 1.7 billion U.S. dollars in their oncology segment in 2016. Remicade works by targeting tumor necrosis factor alpha and inhibiting its activity, but unlike similar rheumatic products like Humira, it is a monoclonal antibody. Rheumatic diseases include conditions that affect the joints and connective tissue. Arthritis and gout are some of the more common types of this autoimmune disease. Osteoarthritis is one of the most common types of arthritis in the United States, it is characterized by the destruction of cartilage and bone. In Canada, 4.8 million adults over 15 reported that they had been diagnosed with arthritis. Everything On "Pharmaceutical brands: Humira (AbbVie)" in One Document: Edited and Divided into Handy Chapters. Including Detailed References.